How far can you spit a watermelon seed? Nothing quite says “summer" like a big slice of watermelon on a hot day. Walk with us as we weave our way through the WONDERful world of the watermelon! Watermelon (Citrullus lanatus) is a vine-like flowering plant. The fruit of this plant — what we commonly call a "watermelon" — is considered by botanists to be a pepo. A pepo is a berry with a thick rind and a fleshy center. So, botanically, watermelons are fruits, and most people think of them as fruits since they're so sweet and juicy. 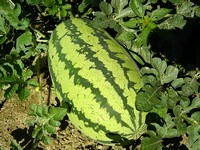 However, watermelons are grown in gardens like a vegetable. Because they're grown like a vegetable and related to the cucumber, squash, and pumpkin, some people think of them as vegetables. Experts believe watermelon first developed in the Kalahari Desert region of Southern Africa. Archaeologists have found ancient Egyptian hieroglyphs that show the first watermelon harvest occurred at least 5,000 years ago. When you bite into a piece of watermelon, you instantly know how it got its name. Each bite of watermelon contains about 92 percent water and 6 percent sugar. Since it consists mostly of water, its name makes perfect sense! Despite being mostly water with a bit of sugar, watermelon is considered a very healthy snack. Its high water content helps keep you hydrated. Watermelon is also a good source of vitamin C, beta carotene, and lycopene. Did you know that you can also eat watermelon rinds? It's true! Although many people don't like their flavor, watermelon rinds are often cooked as a vegetable in China, which produces more watermelons than any other country in the world. The Chinese stir-fry, stew, and even pickle watermelon rinds. If you ever visit Japan, you might not recognize watermelons if you're looking for large, round melons. 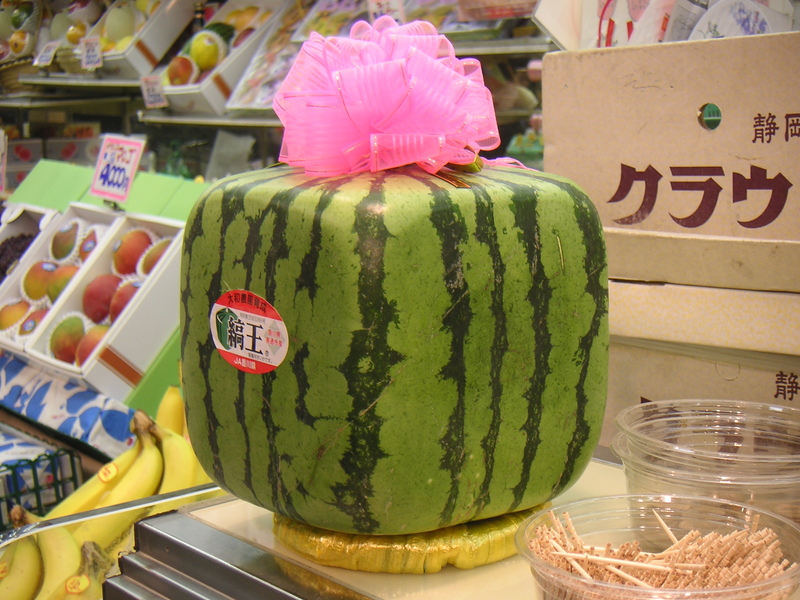 Japanese farmers have developed ways to grow watermelons shaped like cubes. In addition to being unique, square watermelons turn out to be much easier to stack. One of the other famous parts of the watermelon is its seeds. Why? They're used hundreds of times every year during watermelon seed-spitting contests. No one knows for sure how such interesting competitions got started, but they have become a very popular part of county fairs and summer celebrations all around the country. So just how far can someone spit a watermelon seed? Pretty far! Jason Schaynot of Georgetown, Texas, holds the world record. In 1995, he spit a watermelon seed an incredible 78 feet 6 inches! Better wear shorts and bring along a fan to tomorrow’s super-steamy Wonder of the Day! If your brain can't stop thinking about a big slice of mouth-watering watermelon, what are you waiting for? Ask an adult friend or family member to take you to the grocery store or a farmer's market to buy a delicious watermelon. Enjoy slicing it open when you get home. Be sure to save the seeds for another activity! Have you ever tasted watermelon rind? If not, give it a try! Ask an adult friend or family member to help you slice up a watermelon rind into small pieces that you can cook like a vegetable. What do you think? Will watermelon rind become a staple vegetable at your house? Why or why not? Ready to have the most fun you've ever had learning math? It's time to have a watermelon seed-spitting contest…and learn about measurement and averages while you're at it! You can also use sunflower seeds if you can't find watermelon seeds right now. Find a spot on a sidewalk or the street to have your contest. Get as many friends and neighbors as you can to participate. Mark a starting line on the ground that all contestants will stay behind. Have each contestant take turns spitting 10 seeds. Use your measuring device to determine how far from the starting line each seed landed. Record all your results in a notebook. Award prizes (we recommend a fat, juicy watermelon!) to the contestants who spitted seeds the farthest overall and the farthest on average. To determine each contestant's average seed-spitting distance, add up the total of all 10 individual measurements and then divide by the total number of attempts (10). We're so glad that you learned something new from this Wonder, jeanna! We're so glad that you learned something new!! Hi, cool! Watermelons are considered fruits, but they're also related to the cucumber, squash, and pumpkin, so they have some similarities to vegetables, too! It's interesting to learn about, isn't it?! We are doing a water project in science and we had to choose 3 questions and one of mine was how much water is in a watermelon so this helped me a whole lot. We're so glad that this Wonder helped you with your science project, Billy! What did you find out? To bad watermelon isn't in the desert. i loved this wonder!!! i love watermelon!!!!!! al day every day!!! Wawamelon I LOVE!!!!!! I wish I could have it everyday! Just wanted to correct that, square watermelons are harder to find than round ones in Japan. Source - I live in Japan. Is a watermelone really 50% made of water???????????? Yum!!!!!!!!!!!!!!!!!!!!!!!!!!!!!!!!!!!!!!!!! Watermelon!!!!!!!!!!!!!!!!!!!!!!!!!!!! Da Best Ever!!!!!!!!!!!!!!!!!!!!!!!!!!!! We're glad you liked this Wonder!! Really interesting article! Great idea for a topic! I love the way you can never predict what is coming next! You guys are really awesome and I love doing these things. How does he do that with no hands only with a knife? Wow that was pretty cool I need to learn how to do that. I have always wanted to know how much water there was in a watermelon and now I know! I have never known so much about a fruit! Thanks for the information! I just wanted to thank you for all the intelligence you guys have given me. You guys rock and I will always be your little "wonder friend" but right now I need your opinion which wonder is your favorite wonder of all time that I should right about in my Wonderopolis report? Thanks again for bringing me knowledge! I did like the video to design a watermelon. I really love it, it's so cool. Do you know Vid Nikolic? Please tell me. He is so cool. I need to ask him to teach me to make it. Please tell me. I tried to do it but I failed at it. Watermelons are the tastiest fruit in the whole wide world! I wonder what was the largest watermelon in the world? How big was it? Where was it found at? Every summer, my grandma buys some watermelons. I could eat 6 slices of watermelon right now! That was crazy awesome!!!!!! I loved it! Wooooooooooooow, that is very neat!!! It didn't tell us how much water was in the watermelon though! But it was neat how the guy made the three flowers!!! That was so amazing. 92% in the watermelon! I think the watermelon weighs 5 pounds! I'm glad the video was a Wonder of the day. I am amazed he could do that. That man was really good. That man is skilled. those watermelons were too pretty to eat. Slice it, then eat it. Hahahahahahahaha!!! Watermelons are awesome!!! The watermelon that he carved was so cool! Have a watermelon for a special snack. Watermelons are very healthy and very good for you, too. Hey, Wonderopolis, do you like watermelons? That was the coolest watermelon art ever!!! Wonderopolis is the best website ever!!! Very interesting, to. Thank you so so so much for the bestest video ever in my whole life!!! We think it's really cool when lots and lots and lots of friends give you more and more comments! You guys are the bestest writers ever!!! That is really neat!!!! It didn't tell us how much water was in the watermelon though! But, it was neat how the guy made it in to three flowers!!!! So cool. I love watermelon! I would eat it all day if I could! But I would never eat the one that man carved! It was very pretty, too pretty to eat! That man is really good. I am amazed that he can do that. Woooooooooooow! I FOUND OUT THAT A WATERMELON IS 92% WATER AND 6% SUGAR. The wonder of the day was great! It was so cool how the person carved roses out of the watermelon. I wish I could do that. Maddy M.
That was a really cool video. I would love to be able to make something as pretty as that! It must of taken a lot of practice and patience. I thought it was going to be silly, but it was really cool. That was great! I want some watermelon now, but not one that looks like a rose. That's cool beans! It makes us happy to learn how much you liked today's Wonder of the Day® and video, Eeyore fan Erica, AWESOME273 and DJ Bacon Strips! We hope you visit Wonderopolis again tomorrow! I thought that was so awesome and I hope you make another video for us to see and watch. I can't wait to see it! WOW! I'm sssooo inspired now. This website's totally cool!!!!!! Cool........watermelons are awesome. It made me want one. My mouth is watering now! Hi there, Freckle Face and Zebr2322! Thank you both for telling us how much you liked today's Wonder of the Day® about watermelons! Be sure to visit Wonderopolis again tomorrow for another Wonder of the Day®! The guy who carved it is so awesome! The watermelon he carved was so cool. I would like to take a bite out of that! WOW, that was amazing! I didn't know that much about watermelons. This website is off the chain! That was soooooo cool! I wish I could do that! I didn't even know all those facts about watermelon!!!!!!!!!!! Wow, he was awesome carving that water melon! This makes me want to eat watermelon! WOW! That is amazing! I would not even want to eat a watermelon that looks like that! I have eaten watermelons all my life, but there is so much I don't know about them! Water makes up about what percentage of a watermelon? In China, what part of a watermelon is often cooked as a vegetable? In Japan, you might find watermelons shaped like a what?